I have a pet peeve: I hate it when reporters, speakers, and even bloggers don’t reveal who they are voting for in the presidential race. Who’s it gonna be? Hillary? Obama? McCain? Yes, I understand some people think that if I endorse one candidate or the other, I could alienate part of my “audience” and the result would weaken my message on motivation, humor, and laughter. I might not get the chance to help businesses increase productivity though levity if they do not agree with my choice for president. I say, “Heck with that!” For the first time publicly, I’m revealing my choice in the photos below. May the best man — or woman — win! I don’t need your vote in the election. But I’d love your business. If you’re in the process of electing motivational speakers, I hope you’ll call. PS. Hey Hillary! Hey Obama! Hey John! I just KNOW politicians need humor in the workplace speakers and motivational speakers too! Give me a jingle and I’ll come do a keynote for your campaign staff. (And dare I say…at the White House?) I’ll see you in Washington, D.C.! I took these photos on a recent trip to Washington, D.C. where I got more than a few laughs and comments. Later we put the shirts on my three kids and had them walk around the Mall as tourists. What a hoot! If you need a laugh, this tee shirt thing was an easy way to brighten anybody’s day. PPS. If you look closely, there is a hint in the photos above about which candidate I truly endorse. Can you tell which one? Comment below and if you are right (and know the the “hint” I’m talking about, I’ll send you a free digital copy of my book. And no…it isn’t the thumbs up thing. WAY more subtle than that! https://www.bradmontgomery.com/wp-content/uploads/2018/11/logo-1-495x198-1-300x120.png 0 0 admin https://www.bradmontgomery.com/wp-content/uploads/2018/11/logo-1-495x198-1-300x120.png admin2008-04-04 10:30:202008-04-04 10:30:20My Presidential Choice Revealed!! The monument is on your right side, and using religious symbology, I predict you are an Obama supporter. Clearly you are giving Hillary the thumbs up signal! The only picture that you gave a thumbs up in was Hillary’s. Therefore I think you love the Clinton’s. Am I right? Hey Brad – GREAT idea, and love the response angle. I say you are supporting Hillary (love ya’ anyway) because you’re doing a sort of “thumbs up” thing with your hands. Keep Rockin’! Ok….no…it isn’t the thumbs up. to be honest, I totally missed that. What else ya got?! Who am I endorsing? Why? I thought you told me that you were running as an independent. I know this because from the look on your face, you’re not wearing underwear. McCain is the only candidate you actually were willing to be pictured with (his face on your chest). You, as with all rational Americans, are clearly a McCain supporter. The Hillary and John pix were taken from the same location, at the Lincoln Memorial, it seems. The Barack pic was taken at a slightly different location. So, I think you were wearing the Barack shirt. But, the Hillary and John shirts, you just stood in the same location and switched shirts for the photo. So, my vote is Barack Obama. Obama picture was taken by itself, as your choice. Then the other two shots were taken in the same location, a few feet away. So that would make your choice Obama who in your mind stands apart from the other two. The candidate you truly endorse is Hilary Clinton, your thumbs up gives away. Ok, if it’s not the thumbs up thing, then it’s got to be Obama because of your shift in location. That changes the placement of the Washington monument and you now cover up the “statue” thing on the right. It’s obviously Hillary ’cause you listed her first (on top). Also, your hair is shorter in that photo so you took that photo first. Hi Brad – Your heart says you are voting for Hilary because of the quite clear endorsement of a thumbs up! Right?! I think you want Hillary because of the thumbs up you’re giving her. I think you should put your coffee cup back on the top of your car so it can cool off some more before you drink it. I would just love it if you came back to training for Pure Romance again. We miss you Brad! Whoops, maybe I should have read all the other comments before I chose. I think you endorse Obama then either because the monument is on the other side, but also because it’s the only shirt that lists the election year. Heck, I don’t know. You might have made it McCain because of the tiny bird that’s flying in the background. Oh, wait. A little windex on the screen and that bird wasn’t there anymore. I’ll say Obama. Indeed, Obama – because of the location of the pictures – the Obama picture actually has the background set up for the picture. Looks to me like you’ve put yourself and Barack right into/over the White House…..let’s see…funny man, funny ears….works for me. Brad you are clearly a flip flopper and thus anyone can tell that you will likely end up voting for Kerry. Get with the right election man it is 2008! The best picture is of you wearing McCain. It has the best composition of the three photos. WELL IT’S ONLY OBVIOUS THAT MCCAIN IS YOUR CHOICE! Gotta be the “change” candidate, Obama. Just the little “change” in your position makes it seem like it’s a HUGE change in location. In the other two pictures you are not standing directly in FRONT of the monument. You are standing to the “Right”. This is the only ‘dead on shot’ from YOUR vantage point. With Obama, you have no shaggy trees in your arm pits, AND it’s the shirt that best fits. Plus, this is the only shot where your palms are in “Jesus blesses you” pose. ‘Dah may La’ that book! It’s Obama because of his campaign logo is blue above white- just like your blue shirt peeking through over the white T shirt. Well, in Hillary and McCain picture you are more or less standing in the same location. In the Obama picure you have changed your location. In the Obama picture the momument in the background is over on your right side and unobsured. So, I will use the SWAG method and state that you are an Obama man! Interesting… ya see I initially thought it was McCain who had your vote because that’s the one where you’re closest to the camera. And there’s that Bush which is closer to you under your right arm. But obviously Bush isn’t running. But then I noticed that in the Obama picture the Washington needle is over your right shoulder, whilst in the other two it’s over your left. That said, as it’s over your right shoulder it that could indicate that you’re vote is right wing so McCain could be your man. Nope, I’m going to say Obama. That’s my final answer. I think that it is John McCain because of the camera shot being a closer shot of you in his t-shirt, meaning you think he is the clear front runner. I’ll have to go with Obama because of the position of the monument. It must be Obama, since the monument is clearly on your right- indicating he is the “right” choice?? I think you are voting for Hillary because it’s the only shirt that appears to fit you. The other shirts appear to be swallowing you up. You have likely worn the Hillary shirt often, it’s been washed and shrunk, whereas the other shirts are brand new, right out of the package, with no plans of being worn or washed. Sorry, I’m from Australia, so I know nothing about US politics. The last time I looked Nixon was in charge. Why isn’t he going for a third term? Hey Brad, you are going for McCain. It is the biggest of the three photos taken. So obvious. Wow, and you have already sent me a copy of your ebook. I just knew I was right. That is super-fast technology you have! ROFL! Brad – This is a great Booking & Marketing angle! I wish I had thought of it myself. I don’t typically fall prey to this sort of mechanism, but just couldn’t resist taking a peek. May you get tons of responses. And hey folks….. BOOK BRAD! I haven’t hired him yet (due to time frames on my end), but his promo DVD not only shows you how he can make your group LAUGH HARD, but the reality is – HE CAN DRIVE YOUR TOPIC or KEY POINTS HOME…. or, at least that is my perception from the quality I’ve seen. Okay Brad….. now how about that $20 bucks? A free lunch perhaps? I’m kidding! Actually, Brad and I have never met or spoken, but we will when I book him to speak. Answer: The Obama picture. The needle is on your right. Indicating your choice is right. As a young man, I was fascinated by” Paul Harvey’s Pauses”. At least that was the name of the album which was produced and sold for some peace and quiet for parents whose children were enjoying the emerging age of rock and roll. It has become clear to me since those years that a well placed pause in a presentation, can create between the speaker and audience an exchange of thoughts and information in the form of mental imagery which would take several minutes to complete by mere presentation. The listeners all want to “get inside the speaker’s head” and be right about what is going to be said next. What you have done here speaks volumes about your ability to connect with people, as you say find your own voice and be real. I took a guess yesterday about your choice of candidates with total confidence. Now, after coming back to see what everyone else is saying (that was what this is all about right? Making us WANT to come back?) I’m totally confused and will continue to check back regularly until this pause is finished and I will see if my guess was right. Masterfully done! I sincerely Applaud you. Your palms are closed for Hillary,half open for McCain and fully open for Obama. So,your vote is for Obama. Your palms are closed for Hillary;half open for McCain;completely open for Obama. Your choice is for Obama. Obama is your choice as the monument is fully visable on the right side, you hands our completly open. Besides it is the third picutre so you would want to be seen with the person you are voting for shirt on the longest. Tell which child is your favorite and what shirt that child wore and then I would know for sure. Obama is your choice as the monument is fully visable on the right side, you hands our completly open. Besides it is the third picutre so you would want to be seen with the person you are voting for shirt on the longest. 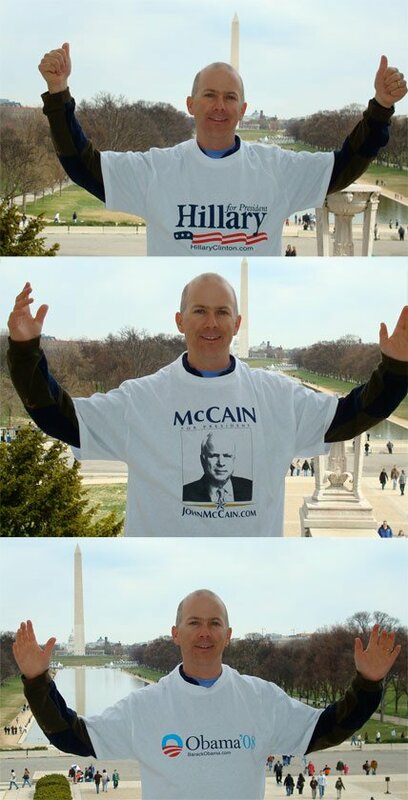 There’s obviously a time lapse of some sort between the Clinton/McCain T-shirt photos and the Obama one. So I’ll have to go with Obama. But you had three kids with you, so things can often go awry that would cause you to get out of position and have a time delay. Knowing this, it’s obviously the first photo with the Hillary T-shirt. But your father plays trombone. Trombonists tend to be more conservative, so I’d have to go with the larger photo and say you are for McCain. Yes, you are dizzy with this display of my dizzying intellect and sending me that e-book while trying to understand this unparalleled display of wit. I’m guessing it’s not the thumbs up because you have now denied that like seven times. I would have to say it’s Obama. You are standing in the position where the Reflecting Pool is in full view (the pool is hidden in the other photos). I think this is trying to tell everyone this is a reflection of your true feelings. I think you are for Obama. Reason? The alt text for the img is “presidential tee shirts obama hilary mccain”. You listed Obama in a different order than the actual pic order. The clear winner is McCain. You have chosen the same hair style… Now that is dedication! Focusing on the number of people, and possible voters, in each frame, clearly you support Obama. Obama. Your right thumb is pointing to the White House and the Washington Memorial appears as a “1” symbolizing the “right one”. It is the one with the only photo on the shirt. You supported John McCain. Obama because the background is larger because he has a broader perspective of things.